Pasar (Traditional market) in Bukittinggi City, West Sumatra Province, comprises Pasar Atas, Pasar Bawah, and Pasar Aung Kuning. As the centre for economic activities in Bukittinggi, many people come to the location for selling, trading and having social relationship with other people. The local government of Bukittinggi has been planned those traditional markets as clothing grocery centre and economic activity centre considering that Bukittinggi City is a gateway of West Sumatera Province connecting with other provinces. To actualize such plan, the local government of Bukittinggi attempt to build some trading centres and other supporting facilities. It is proposed to give the best services such as quick services and comfortable location for trade and sell activity. In addition, for you who want to buy some goods there, please do not be hesitate to bargain first. The price will be higher than usual when you do not bargain for a lower price. You can find a number of goods that you want such as clothes, household appliances, books, and other items there. You can buy them either by wholesale or by retail. As it lies in the downtown of Bukittinggi City, you can easily find those three traditional markets. Public transportations can also be easily found there. 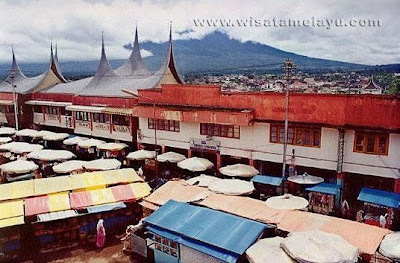 Those three traditional markets are situated in Bukittinggi City, West Sumatra Province. Indonesia. Just take land transportation to reach the locations. It is around two hours from Padang to Bukittinggi. Its cost range from IDR 15.000 to IDR 20.000 per person (February 2008). After being in Bukittinggi, continue the trip to those locations by angkot (typical of public transportation in Bukittinggi). Considering the locations which lies in the centre of Bukittinggi City, you will easily find lodgements or hotels around the locations. For food and beverages, Rumah Makan Padang is the right place for you, and do not forget to try Nasi Kapau.